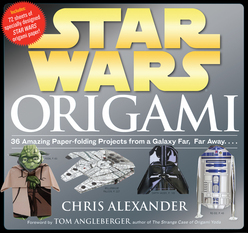 Sure, you could do all of the projects in this book using regular origami paper, but what makes this book so extraordinary is the specially designed origami paper. Each of the 36 projects has two sheets of corresponding origami paper featuring art drawn from the movies, so your origami Yoda will look just like the wise Jedi master you know and love. The 72 sheets of origami paper is bound into the back of the book, and is perforated for easy removal.